Our speaker, Alexandrine Boudreault-Fournier is Assistant Professor in Anthropology at UVic. Since 2000, she has conducted ethnographic research in Cuba about youth, popular culture, music, media, and infrastructure. Many things have happened since December 17, 2014, the day that Barak Obama and Raul Castro announced the beginning of the process of normalizing the relationship between Cuba and the United States. 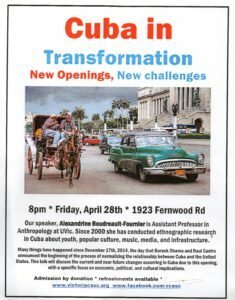 This talk will discuss the current and near future changes occurring in Cuba due to this opening, with a specific focus on economic, political, and cultural implications.